Reading the book: Before? Or after? Last week, I contemplated re-reading “Harry Potter and the Half-Blood Prince” in preparation for seeing the movie. (I’d read it and enjoyed it several years ago, when it came out, but didn’t remember much.) I decided not to, because I got busy reading other things, and because I thought it would be fun to let the movie surprise me. It did. I’d forgotten, for example, who the Half-Blood Prince was, and who exactly committed a nefarious deed late in the book, and who was Harry’s date for the Christmas party. (Hint: These three are not all the same person. And wouldn’t the book have been even more interesting if they were?) I could chalk all of this forgetfulness up to advancing age, but my date for the screening had forgotten too — and he’s just 14. Which brings me to a question I’ve often pondered: Is it better to read the book before the movie, or after? Usually I read it before, just out of practicality: I need to know, for the review, whether the film is a close adaptation or not, and there’s often not time between the screening date and publication deadline to get the reading done. (If you had stopped by my desk this afternoon, you would have seen me frantically flipping pages in “Harry Potter and the Half-Blood Prince,” trying to verify a few things.) But I love letting a movie surprise me. I read “Revolutionary Road” after watching the movie, and was thrilled by both experiences, all the more so because I had no idea what Kate Winslet’s character was going to do. Perhaps the ideal thing is to read the book long before I see the movie, so I have time to forget the details. Which means I should get around to reading “New Moon,” “Shutter Island,” and “The Lovely Bones” . . . hmm, right about now. So, do you like to read the book first, or see the movie first? And are you eagerly anticipating “Harry Potter and the Half-Blood Prince”? My review will be online Tuesday morning, but I’ll tell you know that I and my nephew enjoyed it quite a bit (though it wasn’t quite as magical as my favorite in the series, “Harry Potter and the Prisoner of Azkaban”). 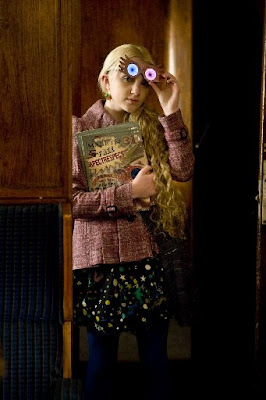 I wish it had contained more of my favorite performance, though: Evanna Lynch, as Luna Lovegood, just slays me. How can she be so vivid and yet so vague at the same time?